We’re often asked if homeowners should simply shut off their irrigation and not think about watering again until spring. That’s a yes and no answer. Technically it may still be fall, but it sure feels like winter is already! While the cold weather might keep you from some of your favorite garden activities, you can at least cut back on the main resource needed to maintain it: Water! We’re often asked if homeowners should simply shut off their irrigation and not think about watering again until spring. That’s a yes and no answer. Yes, turn off your automatic irrigation system so that you can water manually as needed, but no, please don’t stop thinking altogether about watering. Winters can be dry here in the Dallas area and so when we don’t receive rainfall you’ll need to give your lawn and landscape a helping hand. Too little water in the landscape. In fall and winter, we welcome the extra rainfall and cooler weather. During weeks that it rains, we may not have to water all all. Annual color and vegetable plantings will usually need a little supplemental hand watering. As we head deeper into winter, you’ll probably need to run your sprinklers once in a month, if it has rained. Keeping rain gages in different zones of your landscape can help you decipher which rainfalls were aplenty and which were lacking. Did we get 1” of rainfall over a week’s time? Then you’re landscape is good to go. While plants may be dormant or semi-dormant through winter, they still put on new roots and take up some water and nutrients. Many plants continue to grow actively through winter in our climate. Not watering at all will simply compound the detrimental effects of our hot, dry summers. A long dry winter may mean your plants won’t make it through the next long dry summer. Too much water in the landscape. Yes, there is a such a thing as “too much water” in winter. Excess water in winter can mean disease for some plants and death for others. Over-watering your lawn can lead to root die-off and fungal issues such as Take-All Root Rot. Certain plants can’t tolerate cold wet soil so they can actually die in winter if watered too often. Agave plants are a great example. Of course, watering when the soil is already saturated typically leads to water waste and runoff. With water being a precious resource, no one wants to waste it! 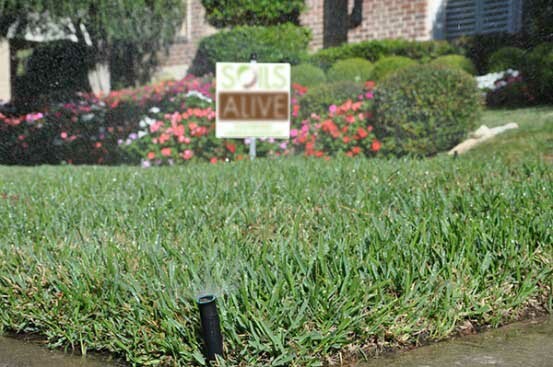 Healthy soil will greatly improve the health of your lawn and landscape in our extreme climate. When soil is bioactive and healthy, you won’t have to water as much either in summer or winter. To learn more about how our Soil Building Program can help your lawn and landscape tolerate the elements, contact us by phone.